Abandon hope, all ye who hate fare hikes. Today, the MTA board’s finance committee voted to approve the fare hike plans. While the full MTA board still has to decide on the hike tomorrow, that vote is all but a formality at this point. “There is little question that this will be approved, if not unanimously, then virtually unanimously,” MTA Board member Barry Feinstein said to NY1’s transportation guru Bobby Cuza. So start stocking up on Unlimited Ride 30-Day MetroCards. The new fares will most likely go into effect on March 2. Riders would see the first service improvements in June, according to material released on Monday. Some of the changes are relatively small, like shaving one or two minutes from waiting times for evening service on the Nos. 1, 4 and 6 lines. Others add hours of operation to some lines. Operation of the B and W lines on weekdays would be extended to 11 p.m. from 9:30 p.m. Some changes, like an increase in service on the G train, would not begin until next December. Cuza also notes that the 3 will always run to 148th St., that the R will go to Forest Hills-71st Ave. at all times, and that the 7 will see more weekend service. According to the MTA, these much-needed service additions will cost at least $16 million in 2008 and $46 million the year after. No matter the price tage, riders along those lines targeted for service should rejoice, and those relying on the B (like me!) should be particularly thrilled by that news. Of course, there’s one giant IF though. The MTA will implement this increased service plan only if their finances hold through the first three months of 2008. If the debt-laden agency’s economic situation worsens between now and March, riders will be saddled with a higher fare and none of the promised service upgrades. “If those are not now going to go through, you know, I feel a little bit betrayed about the whole thing, and so should the customers,” NYCT Riders Council representative and MTA board Andrew Albert said. For all the negativity surrounding the fare hike, these service upgrades should soften the blow of the fare hikes. Unsurprisingly, the MTA hasn’t done a great job pushing these service upgrades as a trade-off for the fare hikes. Had they done so, I believe the public would have been more accepting of the hikes. 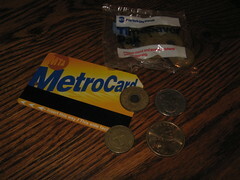 Photo of the old tokens and a Metrocard by flickr user MacRonin47.